While it seems like a fire sale, there might still be room for these companies to drop. Over the past 12 months, the market has returned 13% -- a healthy improvement that no investor should take for granted. However, over that same time frame, some of the most popular stocks out there have suffered enormous losses. All three stocks we'll cover today -- cybersecurity player FireEye (NASDAQ:FEYE)and retailers Sears Holdings (NASDAQOTH:SHLDQ) and The Container Store (NYSE:TCS) -- are down 50%. Sears' downfall has been well documented. The once all-powerful retailer has seen sales shrink 33% since fiscal 2014. And while some of that can be attributed to the company deciding to close underperforming stores, its remaining base has had trouble attracting customers as well. CEO Eddie Lampert is trying to prop the company up by selling real estate, but that has only gone so far to appease investors. And The Container Store seems to be a victim of its own success. The company enjoyed steady growth before going public, as it was laser-focused on an organization-focused niche in home furnishings. But it has turned out that the company has a pretty narrow moat -- it doesn't take much for others to offer similar products at cheaper prices. That helps explain why same-store sales were down 1.4% last quarter, and were flat during the past fiscal year. Even though the Container Store was able to reverse its fortunes and become FCF-positive, this isn't a start-up that has to reinvested millions of dollars every year into innovation. It is a brick-and-mortar retailer that has been around since 1978. 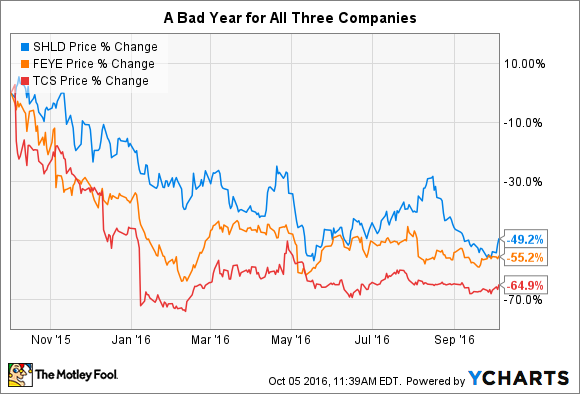 FireEye and Sears are bleeding money out, and it's tough to see when that will stop. In retail, your brand is your most valuable competitive advantage. But it's clear that both Sears and The Container Store -- as well as many winners back when we had a mall-centric culture -- don't have terrible valuable brands. The fact of the matter is that the age of e-commerce is upon us, and it's hard to see how the competition could offer the same thing that these two do, at lower prices, over the Internet. In FireEye's case, the company's approach to detecting vulnerabilities was unique when it came on the scene, but it isn't too hard to replicate. Additionally, as with any cybersecurity firm, the downside risks associated with being responsible for any type of security breach while on the watch is enormous. For those reasons, I think it's best for investors to look elsewhere when considering where to put their hard-earned dollars.